After all this time making soap, I still cannot figure out any consistency to when or why soda ash shows up on the tops of my soaps. I find that spritzing with rubbing alcohol works great, but only if I persistently spritz it as it is setting up for the first few hours, and then I also have to spritz it every day for the first few days to keep it from forming. It's a bit of a pain to babysit it, but it's the only thing that I have found that keeps the ash away the majority of the time. I find that my gelled soaps usually don't get ash, but I usually try to avoid gelling, so that doesn't help. Sometimes, it forms even before I've had a chance to spritz the top. And sometimes, due to the embeds I put on top, I can't spritz the tops because the rubbing alcohol would ruin the top or the embed. Nothing more frustrating than having an intricately detailed top covered up by white ash! 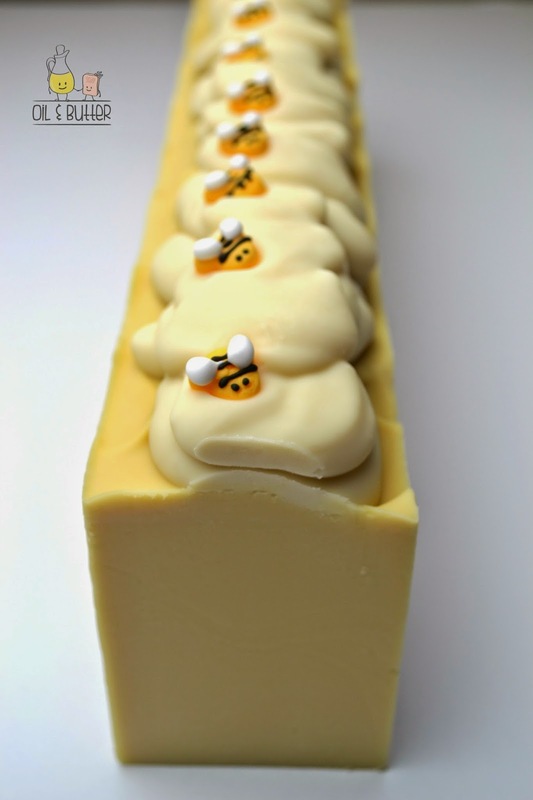 I was trying to think of how I could avoid ash with my bumblebee soap, and then I remembered that I had seen a video from Kia of Petals Bath Boutique a while ago, and she showed how she was able to avoid ash by using a combination of plastic wrap and rubbing alcohol. Just as she did in the video, I waited just until the tops were not sticky anymore, and then I spritzed the top with rubbing alcohol and covered it with plastic wrap (so that the plastic wrap was actually touching the entire surface of the top). I was so happy to find that there was no sign of ash at all on the tops this time! Kia very kindly gave me permission to share her video here with you. Thank you Kia! Do you have any other tricks you use to avoid ash, or do you find that using certain ingredients seem to trigger or help deter ash?